No clever opening, just some thoughts on the first in the new "canon" to pick up where Return of the Jedi left off. Picking up months after the Battle of Endor and the deaths of the Emperor and Darth Vader, the surviving factions of the Empire are trying to maintain their grip while the Rebel Alliance morphs into a "New Republic" While on a reconniassnce mission Wedge Antilles discovers several Imperial Star Destroyers parked above the planet Akiva but is captured before he can warn his allies. The imperials are meeting to decide their next move for survival, with various squabbles and debates either to give in, fight or just hide and wait. Of course their presence brings attention and eventually it's up to a ragtag group of characters-former Rebel pilot Norra Wexley, her rebellious son Temmin and his loyal battle droid Mister Bones, bounty hunter Jas Emari and former Imperial Loyalty Officer Sinjir Rath Velus-to try to stop them and prevent further bloodshed. Meanwhile the rest of the galaxy is coming to grips with life post Palpatine. Advertised as the centerpiece of the whole "Journey to The Force Awakens" Aftermath is getting knocked for a variety of reasons-the complete discarding of the previous "Expanded Universe" series of books, the lack of familiar characters, writer Chuck Wendig's style, etc. 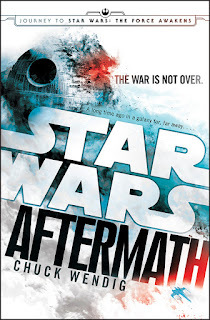 Having finished it I found Aftermath an intriguing if somewhat frustrating but ultimately worthwhile book that if it fails to live up the hype (or past glories like Timothy Zahn's Thrawn Trilogy) is not the complete abomination that some Star Wars fans are making it out to be. To get the bad-or dark-side of the book does suffer from some worn out cliches, most notably in Norra and Temmin's relationship and characterization. The former is a pilot suffering from PTSD while her son is really just a whiny brat who brings to mind (shudders...) prequel era Anakin Skywalker. It's not that I had a problem with Mister Bones or Temmin's development but his constant whining ultimately worn thin. The other major flaw of the book is the "interludes" which are uneven since they mostly center on characters we don't know or see much of. It's an interesting concept and some of them are interesting but only one starring everyone's favorite scruffy looking Nerf Herder and his old pal Chewie capture the flavor of Star Wars and sets up possibly where they were in that 30 years after Jedi. But for all of that Wendig does deliver some good characters that might play out in future novels. In particular Sinjir, a former Imperial who decides that the Empire it self was flawed and possibly needed to be destroyed and Admiral Rae Sloane (a character introduced back in the novel A New Dawn), a loyal Imperial who sees that her attempts to form a solid leadership will fail and is setup in the final pages as a potential big player in the new universe. Wendig also delivers some rousing sequences such as a drop into Akiva by New Republic soldiers and the standard big space fight finale well. 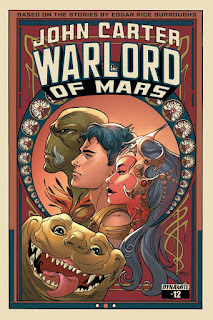 I think what fans need to do is just put aside the Expanded Universe and try to give this book a shot. If you don't like it then fine but in the end Aftermath is not a total abomination either. It's a good-not great but good-novel that I enjoyed. Rating: *** out of 4.